Stop by before or after the Elyria Memorial Day parade for breakfast. Offering: pancakes, sausage, fruit cup, and your choice of milk, orange juice, or coffee. Looking forward to visiting with you at the fundraiser...Thank You! Where: St. Andrew's Church Gym, 300 3rd St. Invest Elyria is dedicated to provide the most information possible about what is going on in "your" Community. This page has links to many of the websites you've asked about on our Facebook page in this last year. If you would like other sites listed here feel free to go to our "CONTACT US" page with your requests. Dave O’Brien | The Chronicle-Telegram Published on April 12, 2019 | Updated 6:39 a. m.
​For the homeless that stop by the church asking for help - donate a McDonald's $5 Gift Cards. Please purchase and drop off at St. Andrews Church (Holly Lane entrance - there is a mail slot there). McDonald's Gift Cards can also be sent by mail to: St. Andrew's Episcopal Church, 300 3rd. St., Elyria, OH 44035. These gift cards are used to provide a hot meal for those people that stop by the church asking for help. ...Thank You! -Lorain Cty. Assistance-Rent, Utilities,Food etc. -Sleep in Heavenly Peace: Need Bunk Beds? -Informational links/CT Newspaper Articles etc. -Kid's Page-Lots of Fun Links Here! ​Link to Form for Homestead Exemption Note: Take the letter saying you qualified to the Water Dept. office at City Hall on Court St.
​Thank You to all those folks that dropped off cleaning products for this drive at Dairy Queen, and thank you to all that donated on our website so we can purchase items for the kits. We distributed the cleaning kits to those in need here in Elyria on March 27, 2019. 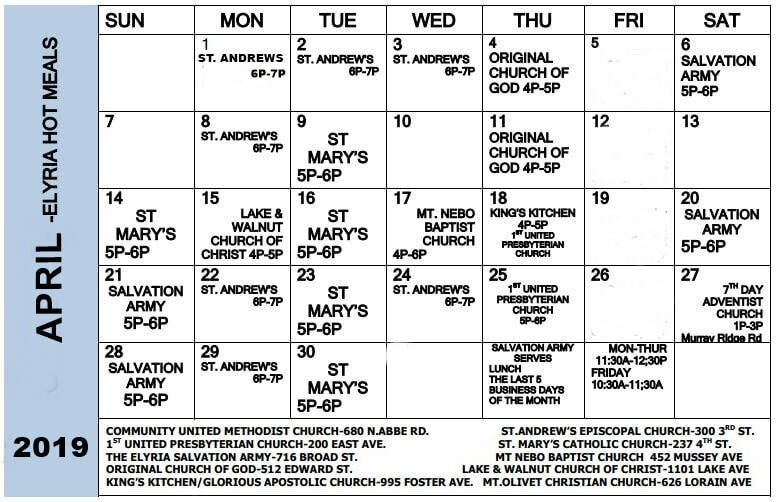 The Quilt Group of St. Andrew’s has served in this outreach since 1997. Our mission statement is to provide prayer and warmth through blankets, sleeping bags, quilts, lap robes and prayer shawls ​to those in need. We meet in the lounge on the second and fourth Thursday of the month from 10 am – 2pm. We have coffee, snacks and a lot of fun. Join us! Header photo of the Memorial Day Parade 2018; courtesy of Robert Rios Tirado Jr.
​Thanks to all that stopped over 1-15-19 to help bag over 500 the clothing items for the Warming Drive: Jane Schuster, Linda Jackson, Jacque Mancuso, Sally Whitfield, Chris & Amanda Pyanowski, Tim and & Mary Bryan, Marissa Peacock, Barbie Blackhall and our host Bobbie Sears. Also like to thank all the volunteers that stopped by on the day of the event to place all the warming items in the square and the volunteers that stopped during the week to straighten out items and those that collected the left over items, that are being used for another drive this winter (The Warm Angels Blanket Drive(see below)). Join Us On Our Journey.....Volunteer!